Having clearly watched from the sidelines for years, Huawei latest has exactly the kind of sensibility we’ve wanted from a luxury laptop. The Huawei MateBook 13 does what any flagship laptop can do – and more – for the same price or even less. For that, the Huawei MateBook 13 is our Best in Class laptop in 2019. 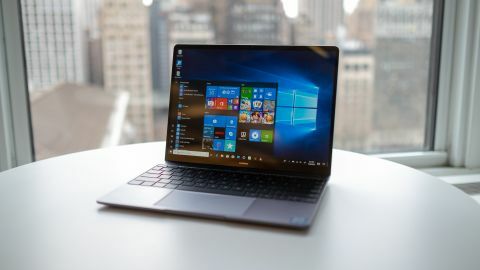 Huawei didn’t really have to improve much upon its best-in-class Huawei MateBook X Pro, but it went ahead and did it anyway with the Huawei MateBook 13. The end result is yet another Best in Class laptop from Huawei. You may have read a similar line in last year’s MateBook X Pro review: the Huawei MateBook 13 offers better performance than most laptops of its class for less cash. Not to mention all within an equally gorgeous form factor that’s almost better looking and feeling than a 2018 MacBook Air – almost. This laptop is fitted into the same aluminum body as before in your choice of a Space Gray or Mystic Silver color option. Open the laptop, however, and you’ll notice one key difference: the webcam has moved – again. Measuring just 0.59 inches (14.9mm) thin and weighing a mere 2.87 pounds (1.3kg), the MateBook 13 is narrowly heavier and actually – just by a hair – thinner than the latest MacBook Air. That’s mighty impressive for a laptop that contains a full-fat Intel mobile processor as well as a dedicated graphics chip. Couple that with a 1,000:1 contrast ratio and up to 300 nits of brightness, and you have the makings of a once-again excellent display. However, the 3:2 aspect ratio allows for more content to fit on the screen vertically, but that means thicker bars above and below your full-screen videos.